Offering you a complete choice of products which include polypropylene ropes. We are highly acknowledged as a trusted name of Polypropylene Ropes. These ropes are used for binding cartons, mending nets, dragging heavy loads, etc. The offered ropes are manufactured by our deft professionals with the aid of modish techniques by using pristine quality polyethylene. 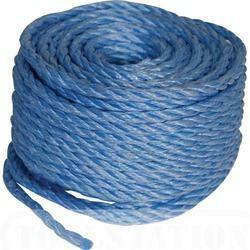 Moreover, we offer these ropes in different colors and thickness at competitive prices.